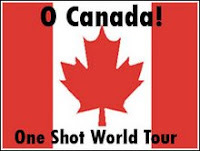 So, Chasing Ray has us set up with another Around the World One Shot, this time, it's all about Canada. I've been under the radar lately (yay for school and work) and just found out about this today. Luckily, this afternoon I read a book by a Canadian. I love it when serendipity works in my favor. Emily's life is going along fine until her crazy aunt commits suicide. Then everything is turned upside down when she discovers that her crazy aunt was really her mother and that the woman she thought of as her mother is really her aunt. Emily cannot forgive her un-mom for keeping this information from her for so long. She runs away to Vancouver in an attempt to find her biological father (not the sperm donor un-mom always said he was). When she returns, she turns to vandalism to get some of her anger out. When caught, she starts to see things in a new prospective. Harvey is from British Columbia! And the book takes place in a BC town, and Vancouver. Orca is a Canadian based publisher and the Orca Soundings line of books is a sure-fire hit with reluctant readers. They all have relevant, contemporary themes and rely on plot to move the book along. The vocab is easier and it has short sentences (the reading level is usually between second and fourth grade, but the content level is definitely high school). The books NEVER talk down to the reader though, which is why they are so successful. I cannot recommend this series enough for the reluctant readers in your life. And now we're going to move down the coast to LA, because I need to turn this book in tonight. Y'all know this is not the type of book I normally read. Tina Anderson was killed as an innocent bystander to a gang-related drive-by. Her brother Teddy is bent on revenge. When executing his plot, he gets caught by the police. After spending 2 weeks in juvie, Teddy ends up under house arrest and stuck mentoring a 12-year-old gang-banger wannabe. In the meantime, Teddy has an elaborate computer virus scheme set up to (1) Spy on his enemies (2) Finish the revenge for his sister's murder (3) Bilk the school district out of 3/4 million dollars so he can set up a new life somewhere else. Sitomer is an inner-city high school teacher and it shows. His frustration and anger at the lack of funding for schools, a juvenile detention system set up to punish rather than prevent, and the idiocy of the code of the streets oozes from every page. I'm also confused by Teddy's mad computer skillz. First off, I really cringe at books that deal with high end technology sophistication. In a year, it's going to look lame because this stuff dates SO QUICKLY. (Don't believe me? Go reread The Boggart) Secondly, Teddy and the narrator spend a lot of time bemoaning the public schools that Micah (the boy Teddy's mentoring) and Teddy go to-- where did he acquire this talent? And does the NSA really recruit high school boys to come do encryption for them? It's also really sad because you can see the only reason Teddy ever had a chance of not being caught in the system was because he came from a "good" family. His older brother and sister graduated from, or attended, really good colleges. His mother has a job, and his father is still around. It's a damning look at the system.